Graduates from Samford University’s Ida V. Moffett School of Nursing, School of Health Professions and School of Public Health were encouraged to confidently pursue their calling to serve as the hands and feet of Christ during the College of Health Sciences commencement ceremony May 13. Rainer expressed that the 239 health sciences graduates shared a common blessing — a calling to share in one of Jesus’ favorite ministries — the ministry of healing. “Realize that if you will abide in Christ, you will know his will for you, and he will equip you to be his hands and feet,” said Rainer. 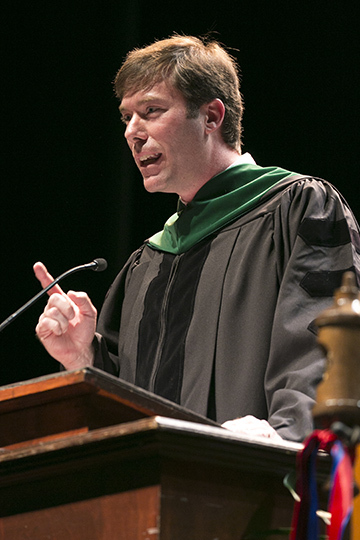 After completing Samford’s sports medicine program, Rainer went on to graduate from the University of Alabama at Birmingham Medical School and the Medical Center East Family Medicine residency program. He is a board-certified family practice physician who practices rural family medicine to an underserved population in Cherokee County, Alabama. He is also the medical liaison for the Children’s Advocacy Center for Cherokee County. He considers his practice a ministry to the community. In closing, Rainer shared Romans 12:9–18, 21 as encouragement of how graduates should live from this first day of the rest of their lives onward. The College of Health Sciences ceremony included graduates from Ida V. Moffett School of Nursing, School of Health Professions and School of Public Health. Ida V. Moffett School of Nursing awarded 173 degrees, including 48 Bachelor of Science in Nursing, 94 Master of Science in Nursing and 31 Doctor of Nursing Practice degrees. Master’s students represented the family nurse practitioner, health systems management and leadership, nurse anesthesia, and nurse educator programs. The School of Health Professions awarded 52 Bachelor of Science degrees, including the first graduates from the school’s undergraduate program in communication sciences and disorders. The School of Public Health awarded 11 Bachelor of Science degrees and three Master of Social Work degrees. The three Master of Social Work graduates represent the first graduates from the program. Retiring nursing professors Joy Whatley and Arlene Hayne were recognized for their respective 41 and 14 years of service to the university. Bachelor of Science in Nursing graduates Kaley Glenn and Katie Kosan were commissioned, second lieutenant, United States Air Force, and were honored at the U.S. Air Force ROTC Spring Commissioning May 12. Samford’s College of Health Sciences was established in 2013 to further the Samford mission while preparing students in an interprofessional environment for some of the fastest growing health-care careers in the country. The college is comprised of four schools — Ida V. Moffett School of Nursing, McWhorter School of Pharmacy, School of Health Professions and School of Public Health. McWhorter School of Pharmacy hosted its commencement ceremonies on Friday, May 6, with 106 graduates receiving Bachelor of Science in Pharmacy Studies degrees and 109 students receiving the Doctor of Pharmacy degree. The College of Health Sciences ceremony was the fourth of seven ceremonies taking place throughout the week.